One hundred years ago Congress secured basic injury protection for railroad workers with passage of the Federal Employers’ Liability Act. For most of the century since enactment of this law, The Moody Law Firm, Inc. has successfully represented railroad workers throughout the United States. For more than fifty years, our lawyers have handled thousands of cases from the claim stage, to trial and on appeal all the way to the United States Supreme Court. Railroad claims can be tough. 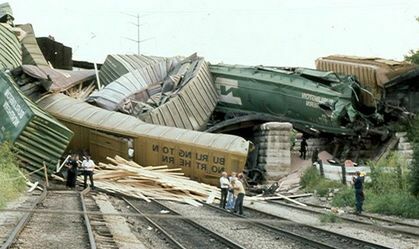 Cases are frequently complex, and they are always hard fought by today’s railroad companies. If you are a railroader who has been injured on the job, you need top flight lawyers who have specialized in railroad claims for decades. It’s the heart of our business and we are anxious to help you. We’re interested in helping you know your rights so that you can make the most intelligent decision possible about your legal representation. Here is a quick summary of FELA basics. If you are a railroader whose work in any way affects interstate commerce (most do), then the railroad company must pay you for injuries caused by its carelessness. It does not matter if you are injured away from railroad property, if a co-worker hurt you, or if you knowingly worked in unsafe conditions because the bosses gave you no option. You still have complete rights under FELA. Congress intended to provide railroaders with the broadest possible protection and through the years has stripped away many of the unfair legal rules that used to prevent railroaders from getting complete justice. Even if you are partially to blame for your own injuries, the railroad is still must compensate you in proportion to the company’s fault. The law is that good. FELA also protects families of railroaders killed on the job by providing compensation to surviving family members for lost wages and other support lost as a result of a loved one’s negligently caused death. An experienced lawyer can help a family through tough times when its attention is understandably elsewhere. We’ve been handling these delicate cases for decades. Railroaders frequently ask if all workplace injuries are covered under FELA. In a word: absolutely. Federal law protects workers from accidental injuries, workplace illnesses and occupational diseases. Our firm is among the leaders in obtaining justice for victims of asbestos related injuries such as asbestosis and mesothelioma. We were pioneers in obtaining recoveries for workers injured by cumulative trauma injuries to the hands, arms, shoulders, necks, backs and knees. We have even handled occupational illness claims for diseases caused by unsanitary working conditions and chronic injuries caused by inadequate hearing protection and exposure to diesel exhaust. If you have been injured as a result of the railroad’s carelessness, FELA protects you, and so will we. FELA cases are filed in a state or federal court and are decided by a jury. This means that a group of citizens, usually in your own community, has the ultimate power to determine whether the railroad is responsible for your injuries and, if so, how much to award in damages. Citizens decide these cases, not some administrative agency. Unlike workers compensation laws, FELA compensates injured workers for all of an injured worker’s damages. This includes lost wages, medical bills, pain and suffering, inconvenience, disfigurement, and costs of future care. That’s important for you to know because claims agents dealing directly with unrepresented railroaders frequently refuse to consider all of the damages that a worker is entitled to receive. They are professionals who are paid to reduce the railroad’s responsibility to injured workers. An experienced lawyer can make certain that you are fully compensated for your injuries and financial damages. You also have important responsibilities under FELA. Most importantly, you should remember that time is working against you and in favor of the railroad once you are injured. Federal law prevents you from collecting for your injuries if you wait more than three years to file a lawsuit. More importantly though, the longer you wait, the harder it is to collect evidence and preserve testimony about how you were hurt. Once an injury is reported, the railroad immediately starts gathering evidence, much of which is under its direct control. An experienced FELA attorney can help you make certain that all of the evidence is collected and preserved before it disappears.